If you are in the market for a new commercial garage door, you’ll need to hire an experienced installation company to get the job done. Do you know who to hire? Do you know what questions you should be asking to ensure you get the right team for the job? We’ve been in the business for more than six years, spending a great deal of that time working on commercial garage doors in the Boston area. Here are some of the smart questions people have asked our team over the years before hiring our team for the job. It’s always a good idea to check out what other people have to say about the company you are thinking about hiring. See if there are online reviews or ask the company if they have references from former customers. Mass Garage Doors Expert is a top rated garage door company on many review sites, so you’ll find plenty of reviews about our services…and you’ll like what you see! What services to you offer aside from installation? Make sure the company you choose does more than just installation. 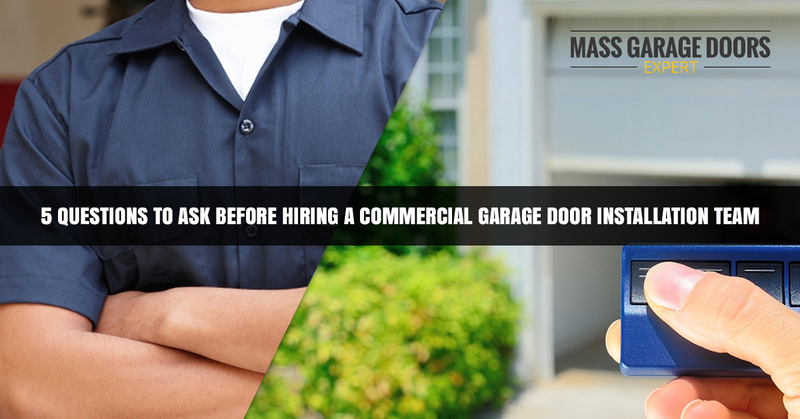 You’ll need a company you can count on if that commercial garage door needs any repairs or maintenance in the future. Having one company who can do it all can save you a lot of time and hassle. You’ll probably end up saving money by being a loyal customer, too. We offer installation services along with repairs and maintenance for both residential and commercial garage doors, so we can do it all. Getting a free estimate from a commercial garage door company before they get started on your project is a great way to judge both the expense of the project and how their estimate compares to others. You shouldn’t ever have to pay for an estimate. You should also be wary of any companies who don’t offer an estimate to you right away. Our team not only provides a free estimate, we provide free consultations so you can get more information about our services and how we can meet your garage door needs. What commercial garage door brands do you offer? While brand loyalty is good, working with a garage door company that only offers one kind of commercial garage door is not. There is very little chance of finding one garage door manufacturer who can fit everyone’s garage door needs. You might prefer a wooden door and they only make metal ones. Or you might need a commercial garage door in an unusual size. Working with a company that offers a variety of brands can help you find a door that’s a perfect fit. Garage doors are expensive. Sometimes commercial garage doors are even worse. Working with a garage door installation team that offers payment plans can help ease the financial burden of paying for a new garage door and help you get the door that you really want for your home or business. Mass Garage Doors Expert offers payment options, making it easier than ever to afford a great new garage door. Ready to get started with your commercial garage door installation? Give us a call today and schedule your free estimate!